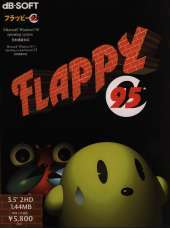 This is an early Japanese game for Windows, part of the "Flappy" series of puzzle games. The beautiful planet Blue Star, the hometown of the boy Flappy, was invaded by the dark emperor Ngaro Ngororo. The prideful Blue Star people take a path to self-assert themselves by self-bombing without desiring battle or invasion. However, Flappy survived by his father on an escape capsule to the next star Zebiras just before suicide bombardment. In the capsule Flappy will see the explosive Blue Star debris rain on the Zebiras star. Flappy, who was wandering around without crying a star, suddenly gathers from the sky "from the heavens", collect the blue stone in the blue area here, when he gathers all, hear the voice saying "All collected ...". Flappy believed that a miracle would happen and began a journey to collect blue stones. It is a stage clear type action puzzle, sometimes referred to as "gravity warehouse number". Operate the main character Flappy and push the blue stone to a predetermined position called Blue Area and carry the stage clear. Blue stone is usually one in the stage, but in FLAPPY 95 and later there are red stones and yellow stones of different colors, and if there is, there is a need to carry it to the red area, the yellow area and so on as well. Besides Blue Stone there is a block named Brownstone which can be pushed and carried like a Blue Stone, but this does not have to be carried somewhere. As a tool for carrying the blue stone, it fills the hole of the stage, uses a bridge, and defeats the enemy. Also you can break it by pressing it against a wall etc. The stage has gravity, and the block falls when there is no wall below. Flappy and enemies are not affected by gravity, but when a block falls from above it will be crushed and die. Flappy can push blocks and throw mushrooms. He cannot touch enemies. It is the purpose of the game to bring the blue stone to the blue area. Because it is heavy, metal enemies can also be crushed. Brown stone can be crushed by pressing it against a wall. Because it is light, enemies of metal type can not be crushed. Evila - an enemy like a red crab. It comes after Flappy with random movements. Unicorns - enemies with green corners. Move right and left randomly. Unicorns of blue (moving randomly up and down), yellow (moving randomly up and down, left and right), red (chasing Flappy persistently) also appear. Hypnotic mushroom - Flappy can pick up and throw. The enemy that's hit sleeps for a certain period of time.